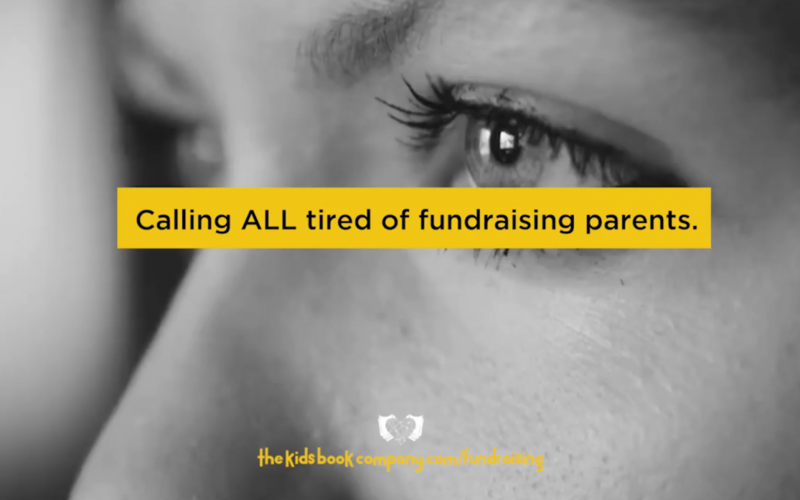 Calling all tired of fundraising parents. The sausage sizzle standers and the ticket sellers. Calling all parental heroes volunteering the last waning ounce of their already miraculous energy to raise money for our communities. Tireless legends that plan their weekends around their designated time slot at the over-priced popcorn stand outside the hardware store and still somehow manage to fit in ALL the kids sports. Plus the never ending list of laundry, the groceries, three sets of teary crises averted through the universal mix of threat, encouragement and blackmail that all parents come to perfect, and unashamedly one incident of kicking something under the couch that you just, can’t, possibly, pick up for the 73rd time. We’ve met you dear parents, we’ve even BEEN you… and now there’s a way. A way not to feel guilted into joining the committee … a way to feel moviestar good when Mrs Not-a-hair-out-of-place looks at you and wonders, you imagine, with a hint of derision whether you finished the darn bottle last night. This is for you dear parents, a way to uplift yourselves in the eyes of the overly political for a childrens’ playcenter committee… a way to raise the funds for Jimmy’s camp or Sarah’s school. A way that doesn’t involve raffling a single paltry ticket with some oddly coloured suit of cards on it. A way to raise money that involves no door knocking or cookie selling or eating nothing but barley sugars for 48 hours. A way to fund raise, in the true sense of raising some decent bloody funds rather than giving change for $2 and hoping the local butcher will comp the sausages again. We are calling you dear parents of community groups, because the Kids Book Company hears your call. Say no more to the folding tables with one dicky leg that doesn’t work like it should. Say no more to the ice cream containers with odd smelling change, strangely similar regardless of whose hand it’s been in. No more to the piles of napkins, slightly sticky from the kid handing them out while gnawing loudly on an incredibly fake smelling blue and purple candy that you really just, can’t stand the smell of. No more to other people’s kids you can’t tell off running amok while you’re trying to convince passers by to look at you and donate, donate not run from the slightly desperate smile that’s forced itself out ontop of firmly clenched teeth. We think you deserve better dear heroes. Leaders of our children’s after school stuff. The oft unsung heroes of the sidelines. You deserve to be able to raise money while sipping on a nice Pinot Noir. Or a bourbon if you prefer. You deserve to be able to be a fundraising hero with your feet up in the embarrassingly wonderful unicorn slippers you keep under the bed. You deserve to reach out to the world beyond the parking lot of the hardware stores, and fundraise to all of humanity. You deserve to sip Pinot, elevate your unicorn clad feet, fundraise across the world and achieve all of that while you’re basically doing what you normally do on social media – while you’re watching something vaguely interesting on Netflix. Let us help you dear parents. Legends of our important community stuff. The Kids Book Company is here to help. We are ripping off the buttoned up shirt and taking off the glasses. A slight change of hairstyle and Clark has well and truly become pale, insignificant and unrecognisable against the superman that is our community fundraising programme. It’s not sugar coated pieces of your soul you’re flogging, not plastic coloured bracelets nor the chance to win a hamper full of donated goods, strangely bulked out with a surprising number of chickpeas. They’re personalised books that kids love and adults love to give. They’re educational and empowering, inspiring and adventurous. They’re bought by parents, grandparents, aunties and close friends. Saved up for birthdays, holidays, celebration of beating the other 6 yr olds across the line in cross country or just for a rainy day. They’re interactive, they grow with each kid and yes…. they are all bought online from anywhere in the world and sent to anywhere in the world. Just send us a message and find out more. It will make you a hero. Be a hero and raise the money you need for your community organisation or educational center. Raise thousands and do it easily for everyone involved. Raise thousands without fighting over the forever unwanted Saturday 2pm timeslot. Visit www.thekidsbookcompany.com/fundraising and take a look. Sign up or reach out, we’re here to help you achieve heroic fundraising goals while you put in the same paltry effort superman puts into his disguise. Raising funds with us – you can do it from your couch…. drinking Pinot, in unicorn slippers. Remember that. Remember it particularly next time you go home with hair perfumed by barbecued sausages and burnt onions at 3 in the afternoon. www.thekidsbookcompany.com/fundraising. Find out more today.